I’ve seen the Bing search engine promote Tony Benn’s funeral to the top 3 searches, while the BBC coverage almost hide’s the funeral! For god’s sake, people cheered and applauded with gratitude in the streets as the coffin went past! There was NO jeering. Many people on social media have commented that the Tory government is manipulating the news output through changing the hire & fire of those that run the corporation to tory supporters and lobby groups. This is readily apparent today, when comparing the BBC output for the funeral of a revered MP, Tony Benn, to that of Thatcher, the former leader, loathed and derided my millions. See Mike, for instance. Benn, top 3 on Bing! Many on Facebook and Twitter have pointed out this difference. So I checked an alternate stream…. the load page of Bing (Microsoft’s search engine). That’s it here. I can only assume that this is due to some BBC editorial decisions following on from a myriad of postings onto the BBC FB and Twitter pages of photo memes and comments like this one. Comparing the military coldness Thatcher funeral, where the police outnumbered the spectators 3 to 1, where the BBC really struggles to show any pictures of anyone or anything that is not part of the establishment, where the thin crowds are strung out and kept back like kids at the zoo, Benn’s funeral was a large, well attended, peaceful affair, where politicos and commentators from all sides paid due respect to a man who always spoke his mind, and was for the most part, consistent. 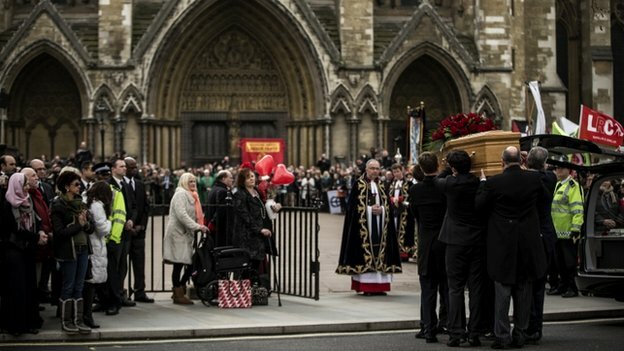 There was a warmth and closeness at Benn’s which was noticeably lacking at Thatcher’s send off. Here’s Benn’s summarised. Follow the links through. Thick crowds, not the thin cold lines at Thatchers, all guarded and marshalled by thousands of police. A large crowd holding trade union and anti-war banners lined the route of his funeral cortege. There were tears and sustained applause as the procession arrived at St Margaret’s Church, yards from the House of Commons. You could tell Tony Benn’s coffin had arrived at St Margaret’s before you could see it – because loud spontaneous applause broke out. Yeah right. Too late Matt. Just too damned late. You should have less fear. They cannot hurt you by speaking the truth out loud right from the off. Now’s the time to take a hold of the BBC and make it what it should be – after all – we all pay for it. Previous: Previous post: Happy Birthday Evelyn!! !